SITUATED WITHIN the world’s highest mountain range and just south of the Tibet Autonomous Region, Mustang is one of the last places in the world where traditional Tibetan culture remains intact. 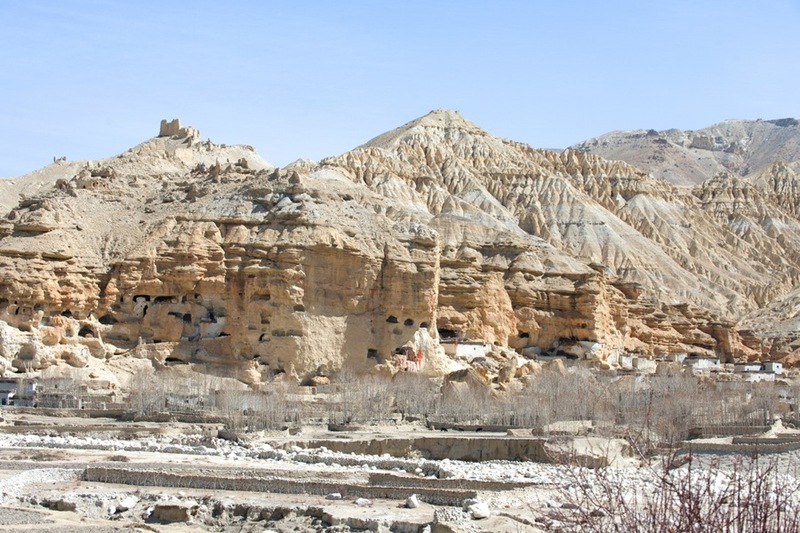 However, due to China’s ever-increasing presence in the region, and their building of a road connecting Lower Mustang to the walled city of Lo Manthang, near the Tibetan border, this status is under threat. There appears to be mixed feelings among the inhabitants of Mustang. Some welcome the road, as it allows for the influx of cheaper goods, but many fear the erosion of traditional lifestyles. 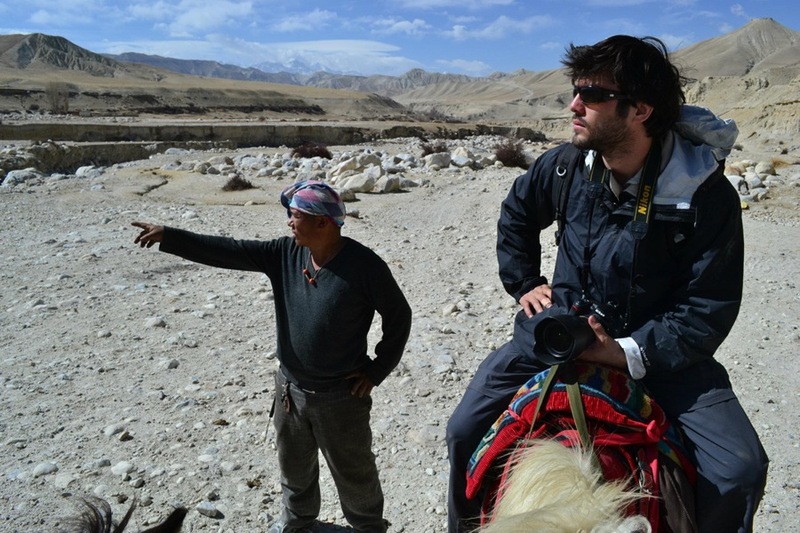 Those seeking an adventure and a rare cross-cultural experience can pay the hefty permit fee of $500 per person and hire a guide to trek the ancient villages of Mustang, either by horse or on foot. 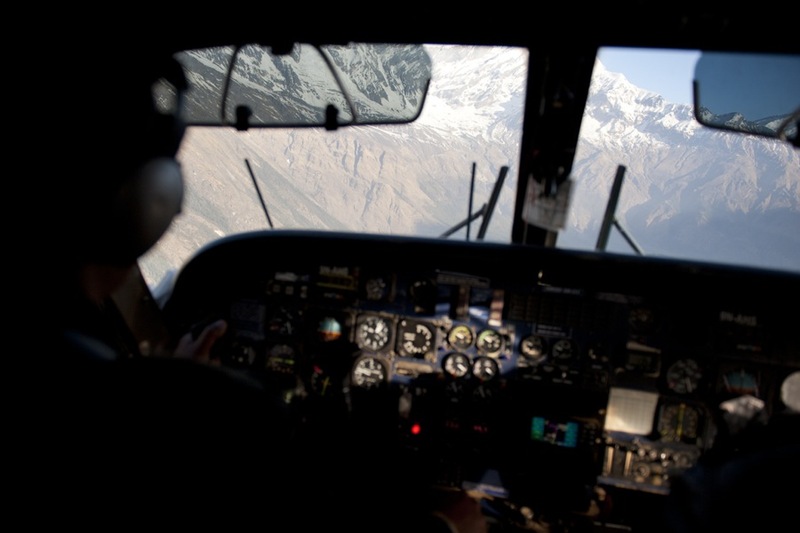 Like most Mustang trekkers, I started my journey with a 20-minute flight from the town of Pokhara to the Lower Mustang town of Jomsom, which serves as an entry point for visitors. After a delay of a few hours, we were rushed onto the runway and into the plane to take off before the high winds returned. Flights are often cancelled, sometimes for days, due to wind and low visibility. Emerging from the clouds shortly after takeoff to blue skies and the tallest mountains in the world is both humbling and exhilarating. 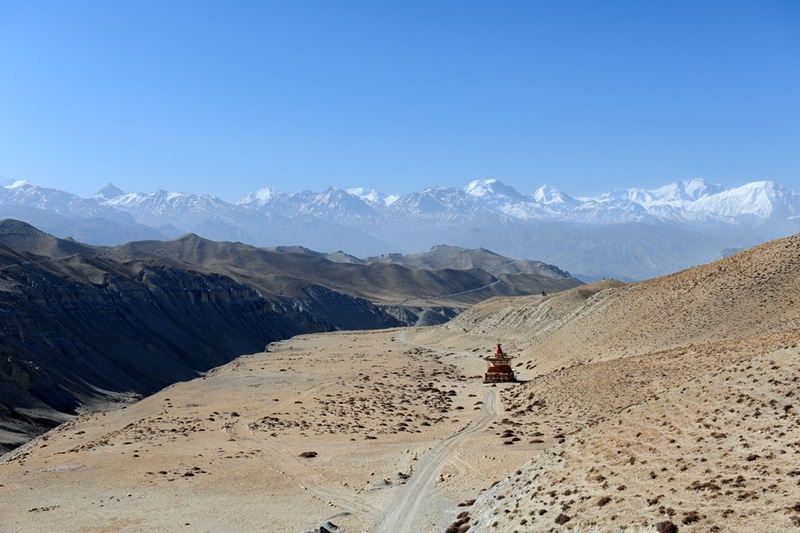 In this photo, a stupa can be seen along a road that runs deep into Mustang, the Himalayan mountains looming in the background. Probably one of the more majestic sights I was able to capture from the whole trek. It's one of the few remaining places on Earth where you actually feel like you're in the middle of nowhere. Because you are. 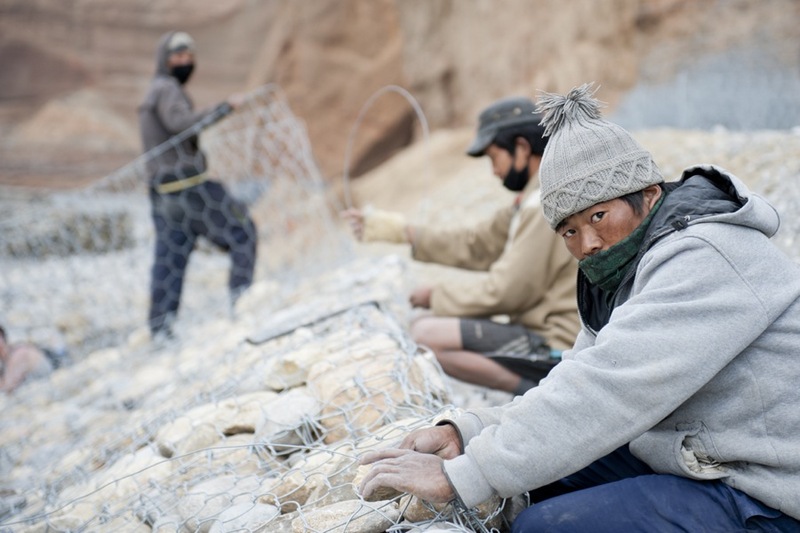 I took this photograph of some kids I came across who were working on the road that will connect Lower Mustang all the way through Upper Mustang into China. A lot of the older people I spoke to seemed to be very concerned about the road and the access it will allow for modernity to flow through Mustang. 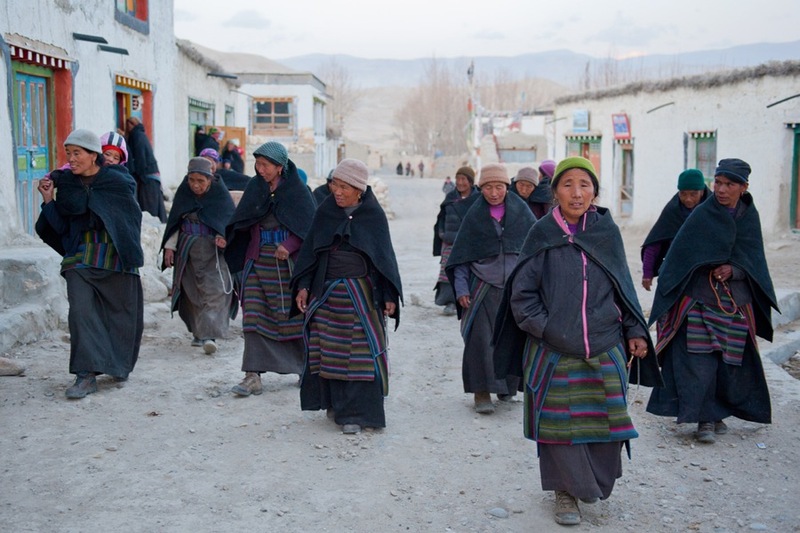 The younger generation, though, were caught between the desires to be a part of the modernizing world and to preserve their Tibetan traditions. We passed a lot of local people on ponies, which made me think about all of the people who have ridden through these mountains for thousands of years. The ponies had bells on so you could hear them approaching. For this particular photograph, I saw a perfect opportunity to frame the riders as they approached a bend in the trail with the Himalayan mountains in the background. As a meditator, it was a really special opportunity for me to visit Guru Rinpoche cave, which was a few days' journey from the start of the trek deep into the mountains and far from any village. 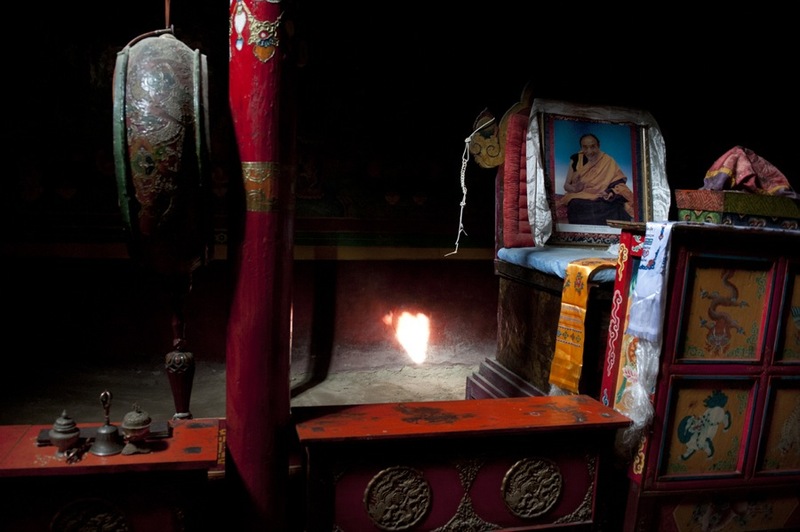 Guru Rinpoche, the "Lotus Born," is said to have spent three years in private retreat here on his journey from India to introduce Buddhism into Tibet, Bhutan, and other neighboring countries in the 8th century AD. The caretaker, seen in this photograph, could not communicate with me at all, but he had an overwhelming sense of purity, calm, and kindness. He had not seen anyone in perhaps months. 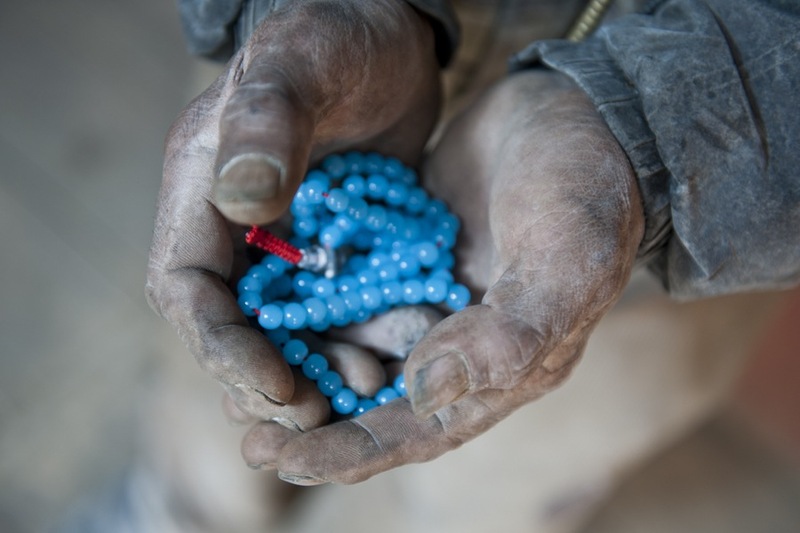 While at Guru Rinpoche cave, I gave the caretaker some mala beads I had, which he was overwhelmingly appreciative for. He was also very happy to pose for some portraits. This is one of my favorite shots, the rich blue contrasting with his worn and chalky hands. A mother and her daughter pose inside of their home (which is also an inn and restaurant) in the village of Syangboche. The food along the trek usually included dishes such as fried rice, noodles, pancakes, eggs, and of course the more popular local dish dhal bhat tarkari, which consists of rice, curried vegetables, and lentil soup. After hiking nearly 20km through steep terrain, Syangboche was a very welcome sight. 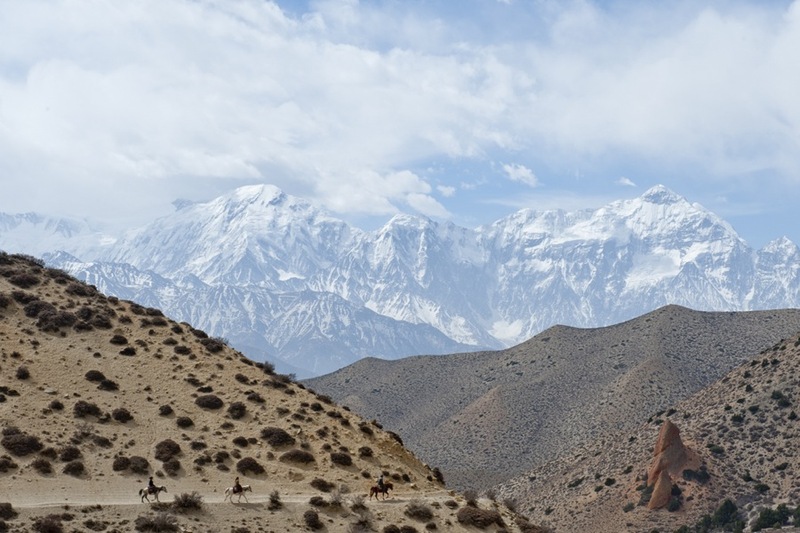 I’ve experienced high-altitude hiking before when I summited Kilimanjaro, but in Mustang, with elevations reaching 15,000 feet, it was definitely a new and challenging experience. I often had to stop to catch my breath along the path. In all my travels, one consistency I enjoy are kids and their willingness to engage themselves with my camera. These twins were especially curious and kept on asking me to take more and more photos of them. 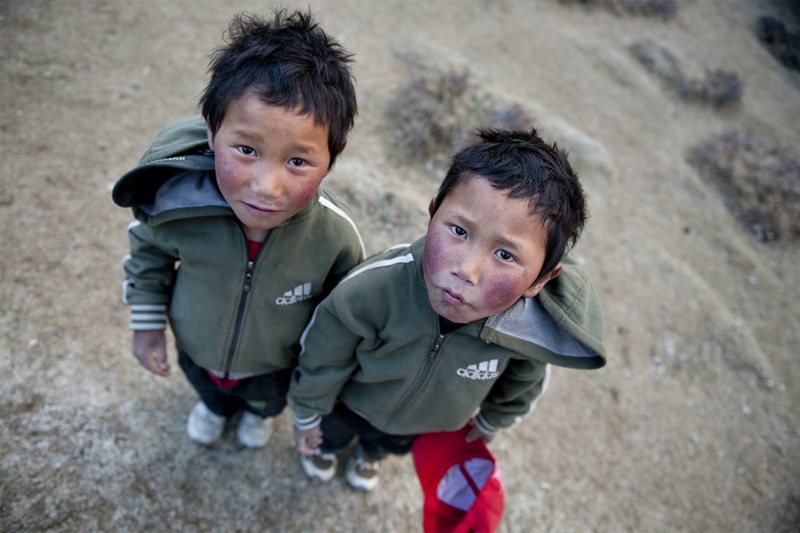 Their red, wind-burned cheeks were a sign of the conditions they endure living in the Himalayas. 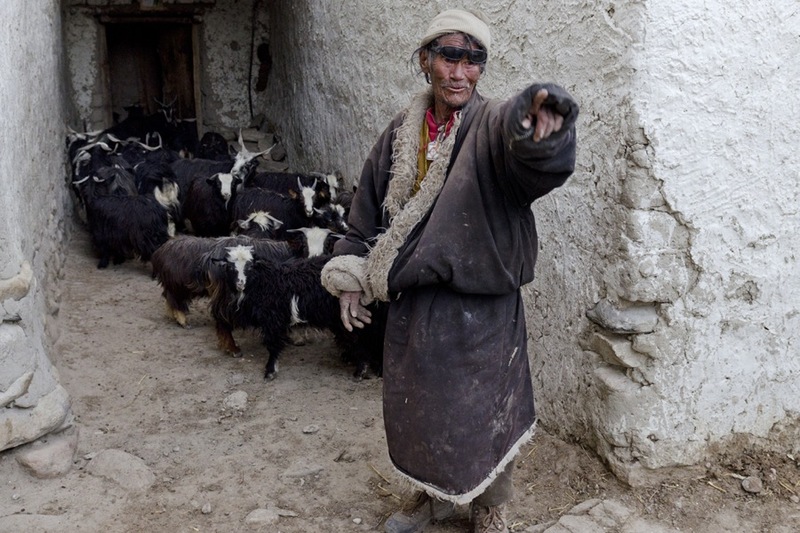 I came across this herder just outside the village of Ghiling. He was most likely heading into the mountains for days or perhaps weeks to graze his goats. He didn’t pay much attention to me and certainly didn’t mind me photographing him. Walking into the Choling Monastery, I noticed this heart shape cast onto the wall from the filtering light. Perhaps the most remarkable thing I saw throughout the whole trek was the ability of people to grow food in extremely arid conditions. Mustang doesn't get the Indian monsoon rains that most of Nepal does, so the people have designed a web of irrigation canals that catch water from the melting mountain snow. 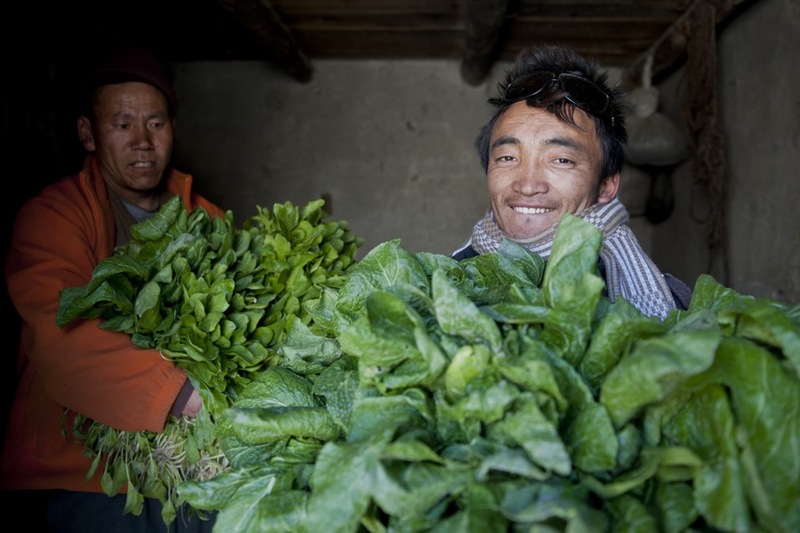 This man has just picked yam bhadur, a commonly grown vegetable in Mustang, and was preparing it for sale. Two pounds sells for about 50 cents. Hundreds of caves like these are found in the region, built thousands of years ago. In this particular photograph, the caves are easily accessible, but many are halfway up high cliffs. I thought of the wandering yogis who made their home for years inside and wondered how they managed to get down the cliffs and into them. Just recently, researchers have gone in to excavate some of the high caves, and many well-preserved ancient artifacts have been found. I met Sangpo Gurung (grade 7) and his friend Binod Tamang (grade 10) at the Nyiphuk Namdrol Norbuling monastery school. 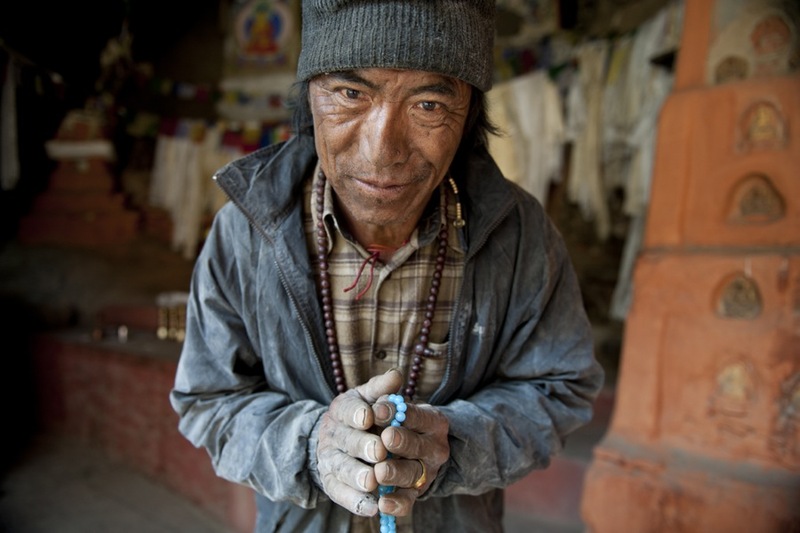 A lot of monks have left Mustang to live a more modern and, as they perceive, favorable life in places like Kathmandu. Both boys were very welcoming despite being immersed in an old Tibetan film they were watching on their static-y TV. 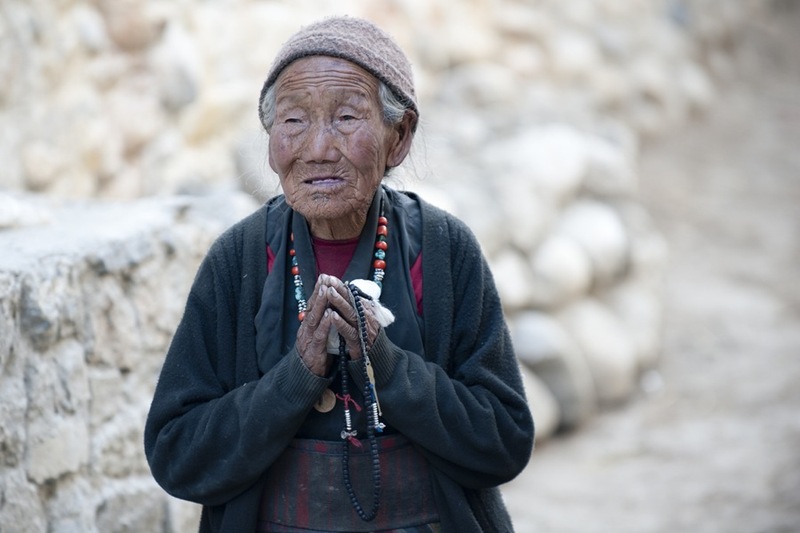 I spent a lot of time walking around the streets of Lo Manthang, and it was very clear how devoted the people are to their Buddhist practice. Photographing was hard in Lo Manthang, as the people for the most part did not really want their pictures taken, which I of course respected. As I headed back to the inn for dinner late one afternoon, I captured this shot of a woman praying. On my last day in Lo Manthang, a group of women walked out of a monastery together and I rushed to get in front of them in order to get a group shot. A lot of them can be seen holding their malas to recite mantras. 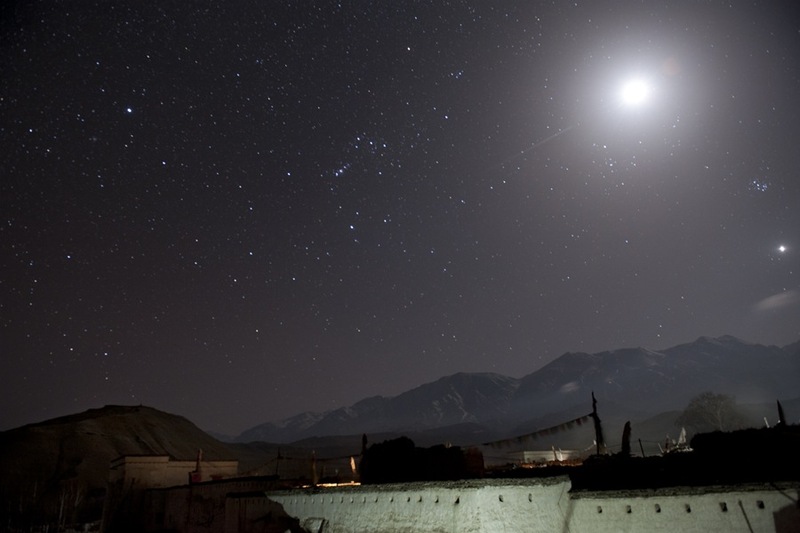 On my last night in Lo Manthang, I climbed to the roof of the inn we were staying at. When I looked up, this is what I saw. I've seen skies illuminated by thousands of stars in places such as Greenland and northern Canada, but never was the sky as impressive as it was here. I spent an hour or so shooting long exposures with a tripod. This guy, in his worn wool jacket and black shades, was a sight. He was having trouble getting his goats into the pasture. During one attempt, they all ran around him and ended up cornered in this pathway. With the help of a few other people, he was eventually able to get them all in. 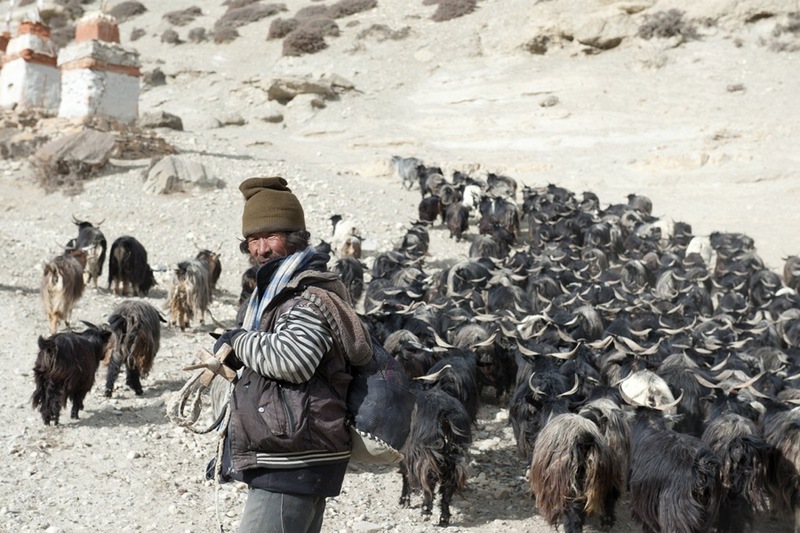 The streets of Lo Manthang were always filled with passing goats and ponies. 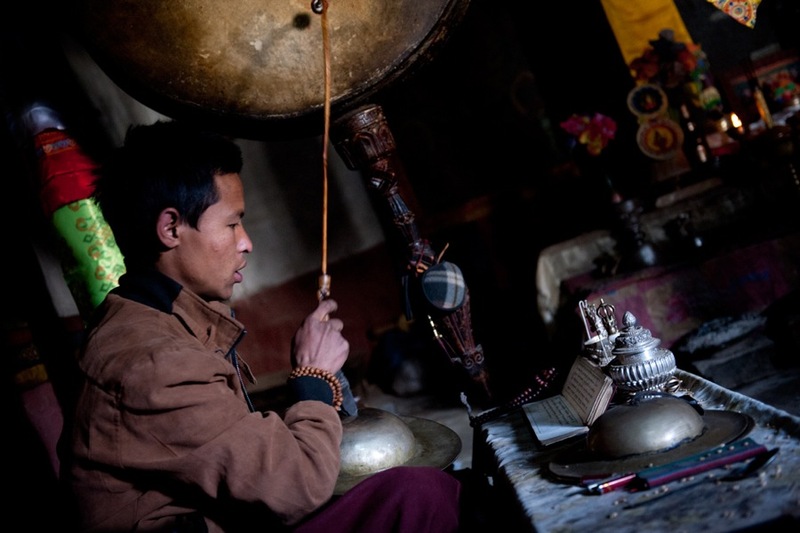 Kunga Sangpo, the monk at Choling Monastery, was kind enough to let me into his practice space. He was very eager to exchange emails with me and asked to meet me in Kathmandu in a couple weeks. 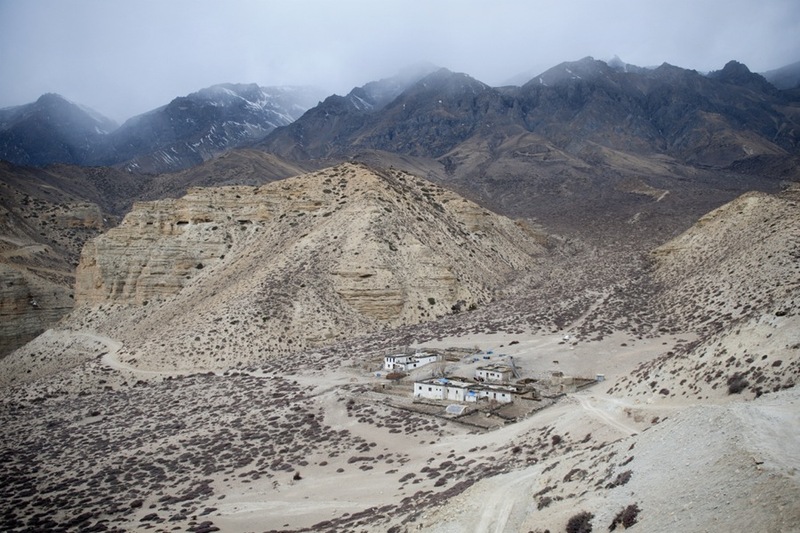 The majority of people in Mustang leave during the harsh winter months and live in other cities throughout Nepal. After all the trekking on foot, I was finally able to explore by pony on an off day I had in Lo Manthang. I took the pony north and in this photograph you can see a local pointing out the border with Tibet. I unfortunately wasn’t able to make it to the border, but I have been told it is guarded by a Chinese military base.